Joining the SH1 and CS1 from a mere month ago are three new Xacti models from Sanyo—the GH2, CG102 and CG20. All three film in 1080i widescreen resolution, and will cost under $230 each. Score! 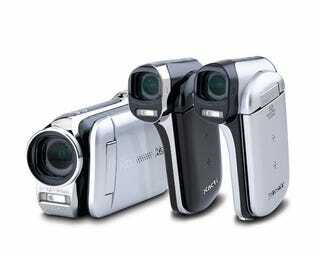 Of course, I'd rather have a camcorder shooting 1080p like the SH1 and CS1, but what's a few less lines between friends? The CG20 and CG102 are both pistol-grip models, with the GH2 coming in a minute barrel shape. Specs-wise, the GH2 and CG102 take photos with a 14.4-megapixel sensor, with the CG20 a 10.7-megapixel one. A "double-range zoom" on the first two models means you can switch between 5x and 12x zoom.